• Physical Education (replacing Health Education). With regard to the different religious affiliations of the children, respective classes (Buddhism, Christianity, and Islam) and comparative religion classes are to be offered. Sixty per cent of the national curriculum contents have been imposed while an additional forty per cent are open to individual curriculum development. The obligatory 60% that are imposed already exist and do not require any further development. A framework also exists for the Kindergarten (Pre-School). The framework follows a flexible approach to leave room for independent development based on the principles of a situational approach. The curriculum is structured according to learning environments that are termed ‘Centres of Excellence’. Curriculum modules are developed for each of these environments based on key real-life problems; the children are motivated to address and solve these problems. That implies the creation of scenarios, relevant situations and their surrounding conditions. A ‘spirit of entrepreneurship’ shapes every Centre of Excellence and Entrepreneurship Education is paired with the education towards intelligent modesty. The goal of the Situational Approach is to support youth and children in their development of autonomous and competent addressing of present and future problems with respect to their communities (solidarity). Autonomy refers to self-determination, individual initiative, and independence. Competence implies knowledge and skill to act properly in complex situations. Competence is conveyed in comprehensive social settings, which is why the Situational Approach differs from a conventional conveyance of knowledge that focuses only on individual ‘pieces of a pie’. Solidarity means a sense of community and an awareness of sharing the world. This includes protecting the weak, not discriminating others, being equitable, peaceful, and striving towards conciliation, not power over others. The more projects are being developed within the Centres of Excellence, the more subjects of the imposed part of the curriculum will be translated into the new structure. Since the development of projects requires additional knowledge not covered in conventional subjects, other sources of knowledge such as the Internet, books, experienced experts, and interns have to be accessed. The national curriculum is not eliminated but its elements are being partially adapted and re-structured. Knowledge from conventional subjects and other sources is being focused on and applied to the projects of the Centres of Excellence. The ongoing teacher training contains the following conceptual features: an anthropology with the child being the author of its own development, important teaching and learning methods such as discovery learning, learning in projects, social entrepreneurship education, community education, situational approach, trauma therapy and curriculum-development. In order to compensate for the unequal starting positions of disadvantaged children it is not enough to put them into a children’s home and to send them to a regular school. This project, which aims to provide first class education, purposely intends to re-invent school, a school in which modern learning and knowledge management can more easily unfold than would be possible within the limited boundaries of a regular standard school. The Thai Ministry of Education is interested in this development and hopes to set free stimuli for other schools in Thailand. The intent of getting away from an orientation around school subjects and referencing the school curriculum more towards key problems and key situations does not mean giving up academic knowledge as useless. It means focusing knowledge from various subjects on real-life problems and applying the knowledge to solutions to the problems. A convenient place for this is a small Centre of Excellence, a space where reflecting and acting can be combined, a laboratory for in-depth, practical studies. These blocks should reflect important local and regional themes. Curriculum development within the project means examining the state curriculum for its use in such Centres of Excellence, and for how it could be put into a meaningful context. The state’s curriculum is not questioned, it is merely organized differently and expanded upon based on experience. This laboratory will serve experimental research in possibilities for organic farming. 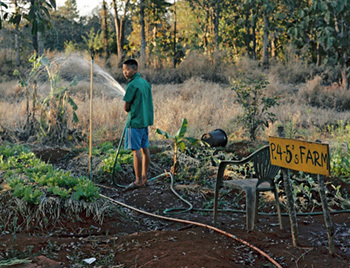 Studies on growing agricultural products without using chemicals can be conducted here. Useful and damaging insects in agriculture can be a topic, or the process of reintroducing threatened types of butterflies and birds back into the area can be covered. The farm is a learning-intensive setting that combines ecology and economy – besides creating products, the goal is also to sell the products, to find niches in the marketplace in an environment dominated by chemically-dependant agricultural businesses. Career options for the youth include working in the area of culture sensitive tourism. Children can learn to blaze trails in the woods from early on: herbal-remedy trails, wild fruit and vegetable trails, insect trails, or colours of nature trails. They get to know the woods as a supermarket from which they can take many things they need for their lives, and which must be managed in such a manner that it lasts. The children and youth can take guests on “soul trekking” tours. They get to know their region, the villages, the markets, the hot springs, the natural and cultural landscape, and let the guests share in this. This learning area will include a restaurant on the farm with youths as cooks and experts in northern Thai specialties. Other people have had experience in this: In the 1980’s, “Hapag Kalinga” was founded in Manila, a restaurant for the upper-middle class with dishes from different regions in the Philippines. Street children ran “Hapag Kalinga” and were assisted by adults. School instruction included the things they had to learn to buy good products at low prices at a wholesale market, to cook very well, to provide friendly service, to calculate, to advertise, and to maintain the restaurant’s standards of quality. The guests – from President Aquino to casual customers – admired the children’s professional work and their wild charm. 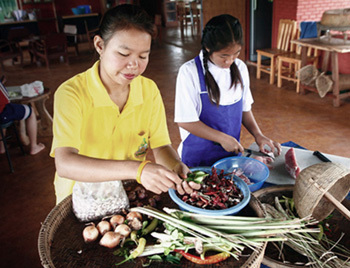 In the bistro in the School for Life, guests can not only look over the young cooks’ shoulders, they can also contribute their own recipes from their far-off home lands. Supporting psychosocial and physical development is considered an integrated process. Curricular elements pertaining to health and sport didactic combine with psychological-therapeutic elements. A spa as a learning area can combine Thai-Buddhist traditions with modern knowledge about body treatment. A children’s circus as a learning area can combine the enjoyment of acrobatics with entrepreneurship. 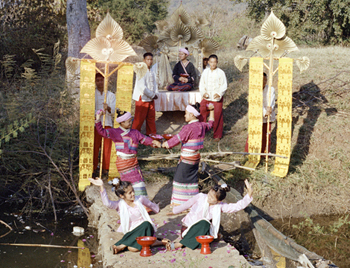 Northern Thailand’s dance and music can be sustained, and artistic craftwork trained. At the same time, new things can arise through intercultural encounters. Workshops with native artists and international guests that include children and youth encourage them to make their own products, as well. Anything from an inter-ethnic jam session with bamboo saxophonists and folk musicians to developing ethnic fashion for children: Approaches can already be found that show the way. Many children are deeply rooted in Buddhism. At the same time, they encounter values that also are part of other religions: Respect for life, providing for the needy, the worth of a human, loving nature. The children grow up bilingually and learn the Thai and the English languages. Adults will communicate in either Thai or English, according to immersion methods. The school teachers also profit from English on the farm: They want to learn English themselves to teach it. Communication also occurs via the internet. 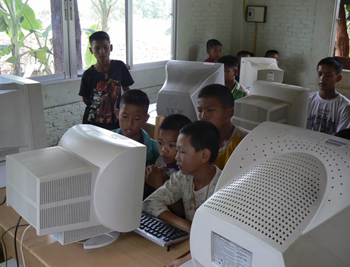 Interactive software makes the children familiar with the computer. They learn to write correspondence over e-mail and to find access to knowledge. They may establish a campus radio station and an Internet radio. The United Nations has developed a curriculum called “Global Concerns and the United Nations” that demonstrates the relationship between “global and local concerns” in a plausible way and creates local opportunities for action. This curriculum can be part of an international and intercultural education that helps children determine their position in the world, and at the same time, understand that we all live in the same world. Both the standards and resource consumption of industrialized countries are far too high: the age of modesty is called for now. The fresh wind of the world market will do the job. But the developing countries also cannot afford to simply go along with the misuse and wasteful destruction of our planet’s resources. It is necessary to discover the quality of “intelligent modesty”. The days of uncontrolled wastefulness of our natural resources are counted. High-quality, simple, mature, durable products are needed. What is wanted is the maximum quality for the pair of pants, the washing machine, the light bulb, the television set. The Centre for Technology and Ecology subscribes to the thesis that technology and ecology can be effectively combined. The Center concerns itself with ideas and first steps, considers small-scale examples, attempts to provide students with possibilities regarding the direction in which thought and action can take. The Center does not want to be Silicon Valley, but perhaps a kind of playground, in which occasional surprising designs and ideas might emerge. 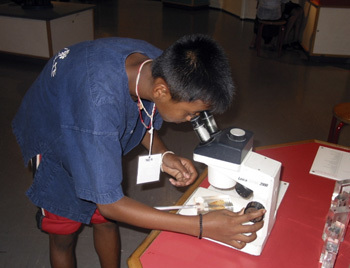 Competitions similar to the German program “Jugend forscht” (Youth Does Research) – illustrate that young people are capable of astonishingly original and marketable technological solutions of ecological problems when one takes them seriously as researchers and challenges them accordingly.